My wife and I would like more details on the trip with Steven Ingraham next year. 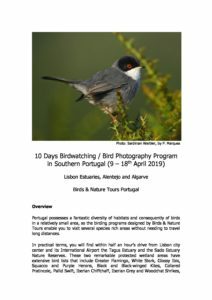 Hi David, we have been trying to reach you via the email you sent to Birding and Nature Portugal and our replies keep returning with an error message. Could you send another email from an alternative address, or check your inbox to make sure it is not overflowing. Or email me directly with your questions: lightshedder@gmail.com.